Destiny Barrera demonstrates her tattoo that she got this past year. The Morton East community speaks out on whether tattoos influence the first impression of someone. First impressions are made in the first few seconds of meeting someone new and are created with very little information about a person. According to a 2015 Harris poll, 26% of people in the U.S have at least one tattoo, however, this percentage continues to increase over time. Tattoos are most popular amongst younger people, and a study showed that women with tattoos are assumed to be more promiscuous or careless. In a random survey of 120 Morton East students, 60 reported believing that tattoos influence first impressions, while the other 60 reported not to believe tattoos influence first impressions. “Not everyone with tattoos got them because they did wrong. Everyone has different reasons [for getting a tattoo]. 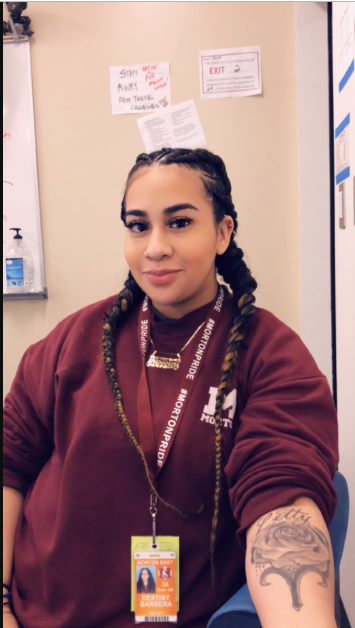 I would get a tattoo for fun and to see what it feels like, and I would want it to be something meaningful and symbolic in my life,” junior Emily Campos said. Many students agree of the fact that they would want their first tattoos to resemble something meaningful and special to their life. “Little tattoos are seen as more innocent and girly that bigger ones, but I think all tattoos are the same regardless of size…I think tattoos look cool, and I would want my first one to be something meaningful, so I would get one of my dad,” sophomore Jada Massallo said. Both student and teachers acknowledge that the size of the tattoo can determine how they will be viewed and judged. “Small tattoos are seen as mementos, while larger tattoos get judged because your body was changed in a drastic way… When I see someone with a tattoo I am curious to find out why they got that tattoo; because I am an art teacher, I see tattoos as an expression of yourself in a permanent way. We change our hair color, and other things, so why not get tattoos?” fine arts teacher, Ms. Crespo said. Family and staff alike can appreciate the creativity that goes into this body art. “Considering I have tons of tattoos, I’ve grown to not care about anyone’s opinion but of course it wasn’t always like that. I cared when I first started getting tattoos as anyone would but if body art makes you happy then sometimes you just got to do what makes you happy despite what anyone else thinks. You can’t make everyone happy,” Morton East family member, Victor Figueroa said. Although many people recognize that some tattoos are gotten with heartfelt intentions, they also recognize that other people can also get tattoos with other intentions. “Yes because you can get a tattoo for any reason because each tattoo can have a different reason for it some tattoos and have a heartfelt reason and other can have a bad meaning to them like gangs,” senior Juan Mendoza said.